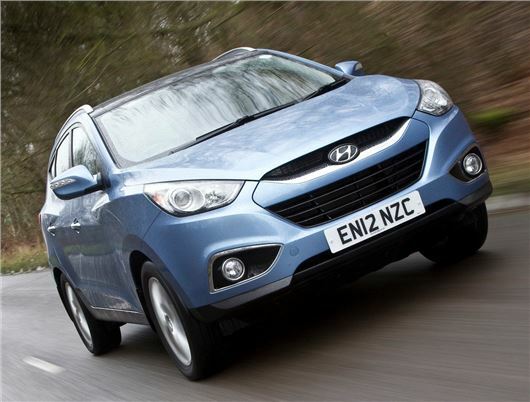 Hyundai has revealed the pricing and specifications of its facelifted ix35. The second generation SUV will be offered with three engines and five trim levels, with prices starting at £16,995 for the entry level 1.6 GSi petrol in S trim. From the exterior you’d be hard pressed to notice that the ix35 has changed at all, but look closer and you’ll discover that Hyundai has refreshed the headlight design and introduced LED running strips. The interior has also been updated, with easier to read dials and upgraded audio systems. The engine line-up remains largely unchanged from the previous generation, with the 1.6-litre GDi petrol and 1.7-litre diesel almost identical to the units used before. However, the 2.0-litre CRDi engine has had its output cut from 181Ps to 136PS to improve fuel consumption (41mpg versus 39mpg previously) and lower CO2 (179g/km versus 189g/km previously). Further changes include the introduction of a six-speed automatic transmission on the four-wheel drive 2.0-litre model. Prices start at £16,995 for the two-wheel drive 1.6-litre GDi manual in S trim, which includeds 16-inch alloy wheels, remote central locking, air conditioning and hillstart assist included as standard. Spend an extra £1500 for the SE trim and you’ll get 17-inch alloy wheels , Bluetooth connectivity, cruise control and rear parking sensors. Customers can also specify SE Nav trim from £19,495, which includes satellite navigation and upgraded seven-speaker sound system. If money really is no object, then the Premium trim levels – which starts at £22,595 – will increase equipment further, with 18-inch alloys, Bi-Xenon headlights, leather seats and privacy glass. As with all Hyundai’s cars, the ix35 is backed up with the company’s five years unlimited mileage warranty, five years free roadside assistance and five years of annual vehicle health checks.